Ex Hot Girl: Back and new hair. Nice hair. Red works on you! Call, text, email, Facebook (whatever) if you need to talk. Sorry thinks are sucking lately. So glad you stayed on your eating plan in Denver and I can't wait to see you soon! and also like (not love ;)) dixie diner for low carb stuff. Yes, the colour looks really great on you!!! <3 it!! Maybe get some bold red highlights on top of this just to make sure you like it! and it would probably look awesome! I love the new hair; I agree with your stylist that you should transition into the bold red; I think it will look great on you once its all done. Super cute! I just went red-head too! Yay! Mine's a little closer to the picture; I had some brown mixed in with it to tone it down a bit. I love it. Welcome to the club! Your hair looks great! 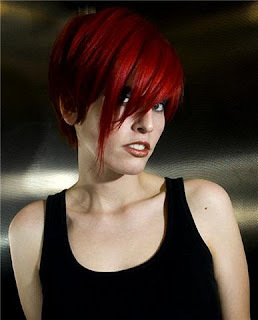 I love red hair; I've dyed it red several times over the years. All ranging from dark red to fire engine red. It's probably safe to start off slow to it; there were plenty of times I wish I would have transistioned slowly into some of the more extravagant colors! I say go for the intense Red I think it will look fantastic on you!! I agree with Betty, you're hair looks really good. Though it would look AWESOME with the bright red too. Your hair looks awesome! Love it. Wish I had the nerve to go red. Sigh. Can't wait to see it when it's at the color you really want! The new color is beautiful! A new blog for recording your dreams? That ought to be very interesting! Will you invite people to analyze it, too? Do you have recurring dreams? I would be a complete bore with that one...I always forget my dreams a little while after I wake up...each blog post would be "Uh. I forgot my dream. Again." Glad you are on the road back! I can't help but think of when you had the big craving for TCBY at the airport, and Mizfit asking if that was a good idea. (No judgement here - I fall off the wagon ALL THE TIME!) I'm just wondering if you would say that was a turning point, since you seemed so torn about having that yogurt? Maybe I am a complete moron for asking that!!! I can just tell that you are "back" now - and very close to where you left off!!! I think as long as you stay away from the simple white carbs you'll still be able to lose weight and eat bread. In order to get the bright red color you will have to lift color. You can't get it by putting color on your already existing color. So, you also have to take into account the damage involved with lifting color. Is it worth it? But, I love the new hair color! Welcome back, Gorgeous...the hair looks great! Low carb bread? I was just talking about this the other day how it seems like the "low carb" craze has seriously died down and I can't find many low carb products here in my area. I love your blog! I'm catching up on all of my reading, and I identify with so much that you discuss. Keep it going and I love your hair... very chic! Just remember that there is no such thing as stress, there are only stressful thoughts. Stressful thoughts only occur when there is a gap between how you want things to be and how they really are. If things were meant to be different, then they would be. But they're not. Every time I feel "stressed" or unhappy about circumstances and events within my life I remind myself of that and immediately I feel better. I have a dream journal too but mine are so lengthy and psychotic I often can't be bothered to write them out! Good luck, I hope you start feeling stress free soon!